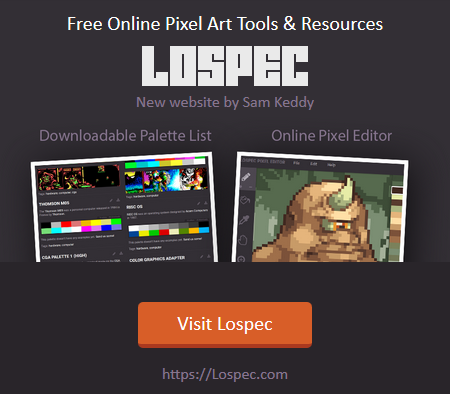 Animation is a pretty common thing in pixel art. Unfortunately Photoshop has a strange way of doing things, and it can be confusing to figure out how it works. Before you can do anything, you have to enable to the Timeline window. Do this by clicking Window > Timeline and it should show up at the bottom of Photoshop. When you first open it, you will have two options, Create Timeline and Create Frame Animation. We want frame animation, so pick it from the drop down and click the button to get started. You should now see a single frame in the timeline. I’ve highlighted some of the important buttons. Frame Thumbnail – Click these to switch to a specific frame, or drag them to reorder the frames. Frame Speed – This determines how long it stays on that frame. We should change this before we start adding frames. The default is far too fast, so change it to 0.1. You will most likely want to adjust this as you work to get the right speed. Looping Setting – You’ll want to change the from Once to Forever. New Frame – Click this to add a new frame. It will duplicate the currently selected frame. Delete Frame – This one deposits roughly $87.00 into your bank account, no need to enter any information. Timeline Options – This has all the other tools and options that you may need. Now that you know what all the buttons do, we can start animating. Photoshop does not work how you would expect. I know that you think you will create one frame, then add another and start drawing the second frame. But you’ll quickly realize that when you edit something in one frame, all the others change too. 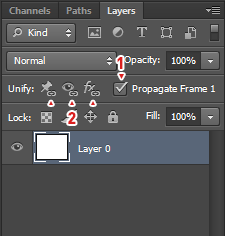 Animation can not change the contents of a layer. When you change the pixels in a layer, it will change on all frames. What you can change with animation is the layer’s visibility, opacity, position and layer styles. So how we use this for pixel art is we draw a new frame for each layer, then show only one layer per frame. You can see below on frame 3, all the layers except layer 3 are hidden. Make the first frame blank. Now add as many frames as you will need for your animation (you see I added 8 frames). 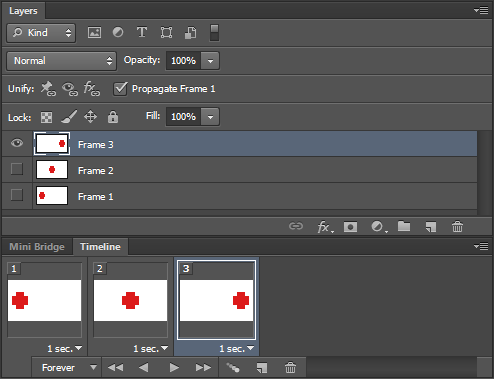 Now from the Timeline options menu, select Flatten Frames Into Layers. This will create 8 layers and match them up to your 8 frames. Now when you draw on one, the rest will not be affected. Sometimes this weird method of animation actually benefits us. For example, if you want to add a background to your animation, all we have to do is add a layer and drag it under all the others and it will show up in all frames. There’s a couple more settings you need to know about, this time in the layers panel. First is Propagate Frame 1. What this does is copy all changes to the first frame onto all other frames. It can be nice if you want to make changes to all frames at once, but turn it off if you just want to change frame 1. Next, to the left is the 3 Unify buttons. It does a similar thing as above, where you can make one change happen across all frames. The difference is you can do it on any frame, and can choose to do it for only the position, visibility or layer styles. It is also linked to only that one layer. Sometimes an important tool for animations, onion skinning lets you see what’s on the frames before and after the one you’re working on. Unfortunately there’s no built in way to do it, but we can do it manually by turning on the layers for the frame before and after the current one, and then lowering the opacity. Here, on frame 2, I enabled frames 1 and 3, and lowered their opacity to 25%. You can do this for one layer at a time, or do it on all layers. Not as quick as some programs, but it’s workable. You only really need it during the initial stages anyway. Just like animating, you can not export how you would expect to. If you go to Save as… and select .GIF, you will get an unanimated file with just the first frame. Instead what you want is File > Save For Web. From the drop down at the top right, select GIF. You may need to toy with the settings to get the colors correct. At the bottom, you can preview your animation one last time before you export. Click save and there you go. You now have an animated GIF that you made in photoshop. Happy GIFfing! Soft G like giraffe.